Even though the exchange rate is fabulous, the constant pull for our money is exhausting. Street vendors are everywhere and very aggressive. One of the three phrases we all know is "NO thanks" (Boo Yao Lay Shie Shie Nee). Ytat and Kanchana, MCC students who both moved here recently from countries that bargain for prices (Cambodia and Thailand) are the best at getting the lowest price. Sometimes they help us buy things too. For instance, at the Forbidden City Wall I had my picture taken in Empress garb for 50 Yuan. Kanchana and I asked if the price was negotiable because some government run places have set prices. They said it was not, so I paid it. But a half hour later Anita and Rose showed up with their pictures taken for 30 yuan a peice. Well, Kanchana wasn't going to stand for it! She argued with them until they offered to give me a second picture free. 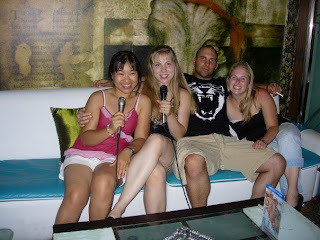 That night we wanted to sing Karaoke. After an evening enjoying ourselves in a private room (not our first choice, we just couldn't find anywhere else to sing) we asked to pay our bill which is when the drama unfolded. They gave us a bill for twice what we had agreed to! Of course no one spoke English but we proceeded to argue with them for the next half hour using paper, pencil, calculator, and lots of pointing. They had charged us an extra 200 yuan for the girl who sat with us, helped us with the remote and clapped for our singing; 150 yuan for the dried fruit we specifically said we did not want and tried to send back, but ate anyway after they insisted we take it as if it were complimentary; another 100 yuan because they brought us Heineken instead of the local beer we asked for; and for good measure they added another 100 yuan charge for nothing they could explain. After removing that charge we begrudgingly paid and left fuming. Four hundred yuan towards the university of life. Lesson: pay in advance for all services in China. We complained to our tour guide who was shocked that we were treated that way in the hotel. She got an apology from the hotel for the "miscommunication" but we in no way accept that apology since the appropriate apology would be "sorry for trying to rip you off".